Hello again people of the E-Discovery Insight world! As always, I try to give you folks practical tips that are aimed at making attorneys’, paralegals’, and lit support specialists’ everyday lives easier. My blog post for today may actually be more of rant than a blog, but that said I want to talk about single-page TIFF vs. searchable PDF format. Let me start by saying I hate load files, I hate load files, and I’ll say it again I. Hate. Load. Files.!!! I also think single-page TIFF image format for review MUST DIE!!! Why is this? Well, as a sales engineer for AccessData I get to talk to a lot of law firm staff and attorneys. One pain-point that I routinely hear across the board at mega-firms and micro-firms alike is how troublesome searching non-searchable single-page TIFF images can be. When a user (in any platform) performs a keyword search the expected result is to actually see the particular word(s) highlighted in the document, and hopefully then be taken by the program directly to the hit, on the page, in the viewer. I.e. SHOW ME THE HIT! If you instead end up looking at a single-page TIFF image, you will likely not see that actual hit unless you go to the trouble of viewing it in an extracted text or OCR viewer. Then you play the game of well let’s try to actually find this on the image and begin to meander through the image hoping to finally find that needle-in-the-haystack word. What a pain! And I have been hearing a lot about this lately. The trend seems to be that firms will spend some untold fortune on a new platform or technology that may be great at dealing with native files, but still has no good way of searching non-searchable single-page TIFFs for keywords. So my friends and colleagues, I propose a simple and elegant solution with 2 major benefits. 2) You get key-word hit highlighting in the viewer!!! What is this magic bullet you ask? 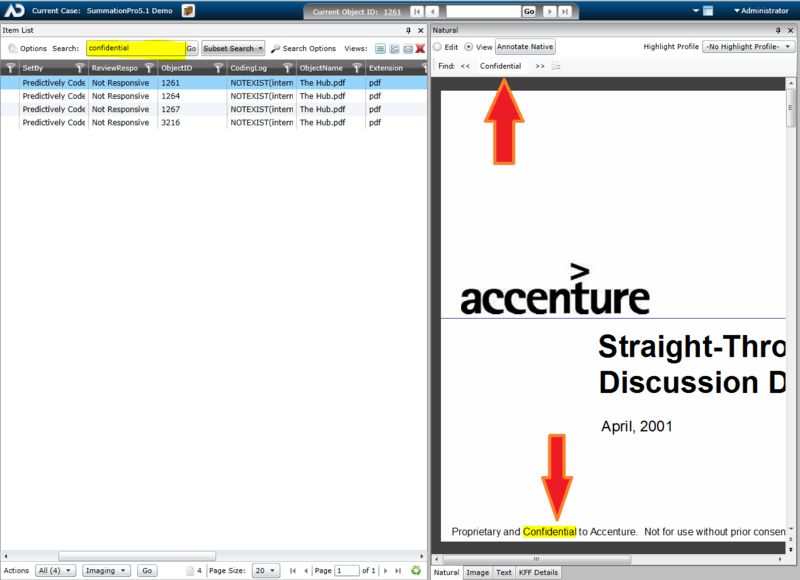 Well the solution is to use Summation Pro’s add evidence wizard and change your image format to searchable PDF! For the most part, single-page TIFFs come from paper. They are either scanned at your firm by a vendor or created in software by imaging native files. If your current process for paper discovery is to scan in-house, then the answer couldn’t be simpler: Change your default scanning format to Searchable PDF! (you will need to OCR the image upstream of Summation Pro but this can often be done by the scanning software or immediately after scanning by using Adobe Acrobat Pro for example). If you use a vendor to scan your paper, just request the vendor OCR the images and give you searchable PDF format as the deliverable. 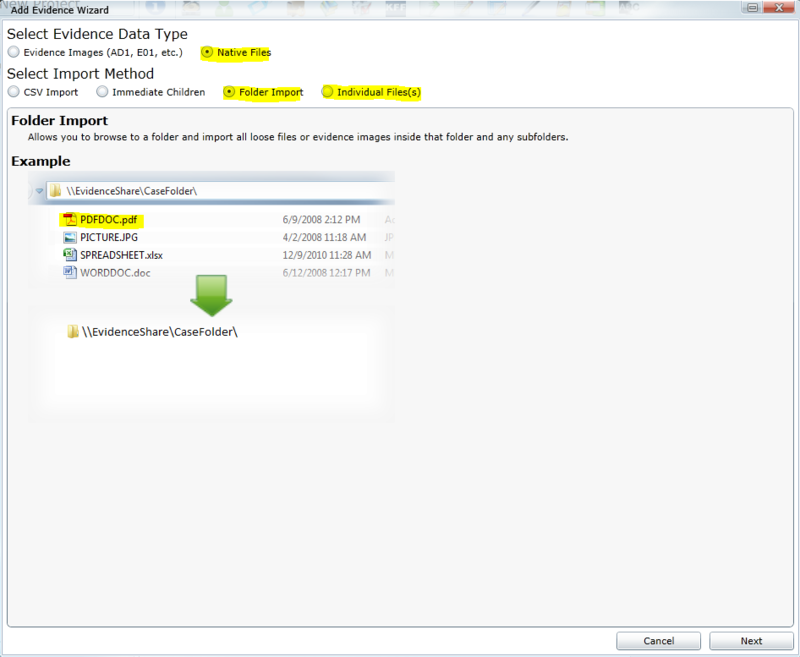 Then you can then use the “add evidence wizard” in Summation to simply load the files natively. This means there is no need for a load file, your cluster analysis result will likely be better, and keyword hit-highlight in the natural viewer will work. In addition the search button in the viewer can help you navigate directly to the next or previous hit in the viewer. See below screenshots. Now I realize single-page TIFF image review sets and requests are everywhere, but with some simple maneuvering you can easily avoid them. In many cases I see this as a self-inflicted wound. Having lots of experience working on the scanning vendor side, I saw many firms simply request single-page TIFF because that is what they had always done. But with Summation Pro we can now re-think some of the basic processes. I think people are often hesitant to change a process regardless of how inefficient it may be. However when it comes to doing YOUR next review, make your life a little easier… If you are the unlucky recipient of single-page TIFFs, try converting them to searchable PDFs first before you load them into Summation Pro and either load the PDFs via the “add evidence wizard” or add the searchable PDF to the .DII load file as an EDOC along with original TIFF image. In summary, when it comes to reviewing paper documents in SummationPro, it is always better to load as native files if you can convert them searchable PDF format first. You want to be able to get the most out of the technology for review, regardless if it’s your client’s discovery or opposing counsel’s. By using searchable PDF format, you can forego the painful process of loading via a load file plus get the added benefit of keyword hit highlighting in the viewer. Scott began to work in the legal industry as a in-house IT Administrator and Litigation Support Specialist for Epstein Turner and Song in Los Angeles, CA. (www.epsteinturnerweiss.com) At this firm, Scott gained extensive experience working directly with veteran trial attorneys and learning the litigation process. In 2005, his technical background and litigation support expertise led him to become a Trial Technician and Department Manager at Merrill Legal Solutions. (www.merrillcorp.com) In 2008, Scott move home to St. Louis and began working with Midwest Trial Services (www.midwesttrial.com) as a Trial Consultant. In 2010 Scott's began to work for AccessData, as a Sales Engineer specializing in AD's Legal Products; Ediscovery, Summation, & AD ECA. Scott is a certified TrialDirector and Summation trainer, and has supported more than 100 trials. During his Trial consulting career he worked on many high profile trials and case with nationally recognized law firms such as Morrison Foerster, Jones Day, Manatt Phelps, and Munger Tolles& Olson. Scott has worked with notable attorneys such as: James Bennett of Morrison Foerster on the JDS Uniphase Securities Litigation, Robert Zeavin of Manatt Phelps on the ICO vs. Boeing Satellite Systems trial, Michael Olecki of Grodsky Olecki on the landmark case Ramirez vs. Los Angeles Co. Sheriffs Dept., and Michael Zellers of Tucker Ellis & West on an anti-trust trial RLH Industries vs. SBC Global Communications. He has helped clients avoid over $20 Billion in damages and has helped others to win over $2 Billion in awards.